Last winter’s special exhibition at Kitzbühel Museum was a great success. It is now being extended, as an open-air exhibition at the Seidlalm. Several hundred fans walked along the Streif every day and were delighted with the wealth of information offered on the display boards and info-screens. 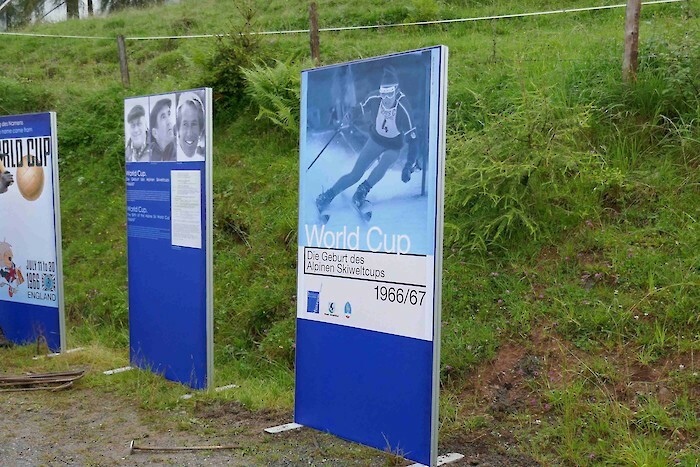 One particular detail, however, was missing - the birth of the World Cup idea at the Seidlalm. Now the successful winter exhibition has been transferred to the Seidlalm. Fans and hikers can check up and read about all kinds of details. Free admission. Thanks go to Dr. Wido Sieberer, Museum Kitzbühel, for making the original exhibition available. Hikers can look forward to a small coffee bar that serves snacks, warm and cold drinks daily from 10 to 18 hrs - weather permitting. The garden with seating invites you to linger. The view is simply stunning.